Today kicks off the taco cleanse. I’m a bit nervous starting out. Who knows how this will change my life? We had breakfast at the Mueller Farmers’ Market today. And there weren’t any vegan tacos. But I pushed through and convinced the nice employee at the Whole Foods cart to make me a Buffalo Chik’n Wrap using corn tortillas instead of the flour wrap. The day was saved! I’m so glad I can eat out of the house without compromising the cleanse. A few hours in, I’m feeling energized and alert. I’m not constantly thinking about food because I know exactly what I’ll be eating. Tacos. And this morning an amazing thing happened. My husband got stuck on the Sunday New York Times crossword puzzle. Could I help? I picked up the puzzle and immediately saw that the answer was taco (69 across). With my help, he flew through the rest of the puzzle. I’m pretty sure this is a sign that I’m on the right track. Other folks are posting their cleanse progress on Twitter, Facebook, and Instagram with the hashtag #tacocleanse. Later this month we’ll host a few taco meet ups. And the whole thing will culminate in a Taco Cleanse Zine. 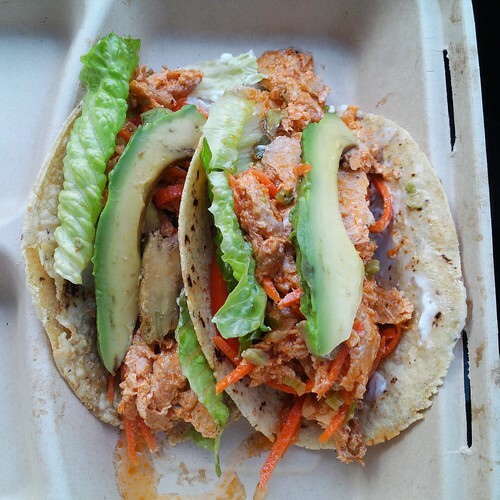 This entry was posted in tacocleanse, veganmofo by mollyjade. Bookmark the permalink. Nice entry, love the “sign” from the NYTimes crossword. Meanwhile: starving! Thanks! I think you used to work with my mother Cathy Frisinger at the Star-Telegram. What exactly is a Taco Cleanse? I’m eating tacos at every meal for the entire month. Tacooossssss. I declare the crossword puzzle thing to be fate. Tacos every meal for a month. That sounds both delicious and challenging. Good luck! Mmmmmm…I love the Taco Cleanse Clan! I can see it now…syrupy breakfast tacos, crispy snack tacos, pizza tacos, burger tacos! Like pizzas, anything can be made into a taco! Yes! I’m trying to decide what my Rosh Hashanah taco will look like right now. Isn’t Whole Foods Awesome!!!! They helped us out making our vegan grandson a burrito once without even flinching! Now if they would just get one closer to us! They are awesome (except when they aren’t). Taco on, you brave warriors. This #tacocleanse is going to rule MoFo! I eat more burritos (of the frozen variety) than tacos, but I full support team #tacocleanse! So rad! I miss tacos! Now this is a cleanse I can get behind! I’m extra loving scramble tacos lately – corn tortillas, leftover scramble, vegenaise, and sriracha. Amazing. Ok. This is made of pure awesome.